Students discuss the mechanism behind total hill collapse after saturating the perlite with water. "The definition of mass wasting is quite simple: the downslope movement of rocks, soil or regolith under the influence of gravity. The process of mass wasting, however, is more complex, involving factors such as slope angle, bed orientation, and moisture content. Students can learn about the process of mass wasting in one class period and also explore the conditions that lead to slope failure through three simple hands-on experiments that use a few basic, reusable supplies." Air pollution in Victoria Harbor in Hong Kong. "As the world's population continues to grow and the consumption of finite resources increases, the most fundamental and pressing issues that societies face are increasingly those of the environmental grand challenges (Zoback, 2001). These include the supply of energy and water, maintenance of biodiversity, protection of the environment, avoidance of catastrophic global climate change and provision of the renewable and non-renewable resources on which humanity's existence depends. The solutions to these challenges will determine the very existence of modern society and the well-being of millions of people (Rockstrom et al., 2009a, 2009b). Arguably, a primary purpose of a liberal education is to prepare students with the tools they need to address these types of grand challenges as citizens of a democracy. This means fostering the critical thinking, analytical, and quantitative skills that will allow them to sift through competing scientific and technical claims, political spin, and marketing hype to effectively address the issues the issues critical to continued economic and societal development." A typical project map from the Ore Exploration Game. Letters on the map are keyed to a set of hand samples. Circled numbers along rivers are sites for which stream sediment assays may be purchased as part of mineral exploration in Week #2. Numbers and letters along the sides function as a bingo-like grid, allowing students to designate squares of land both for surface surveys in Week #2 and for placing bids at the end of the project. Students add fold symbols and fault U’s and D’s, and show surface ore in solid red and concealed ore with stripes. "Geology 101 Introductory Geology at Albion College meets the Science Mode general educaton requirement through which students learn the process of science and the impact of geology on their own lives. To help students achieve these goals, we devised two multiple-week lab projects to serve as the culmination of each half of the semester, replacing traditional lab exams. One of these is a research project, described in Lincoln et al., 2007. The other is the ore exploration game (Lincoln et al., 2011). The game requires students to integrate material covered in 6 weeks of lectures and labs on minerals, rocks, ores, structures and topographic and geologic maps, and to apply what they have learned to a practical problem. Students divide into teams or "mineral exploration companies" of three to four members. They are given rules for the game, an exploration budget, a geologic map constructed by us, (Figure 1), a set of rock samples keyed to the map, and worksheets to fill out as they collect information. (A sample set of these materials is available on the NAGT web site at https://nagt.org/nagt/teaching_resources/teachingmaterials/58649.html.) Their assignment is to use this information to locate ore bodies, both exposed and in the subsurface, and to acquire the rights to these through an auction on the last day of the project." "Biodiversity matters for any study comparing assemblages of organisms. Take away the "bio" prefix and we can think about diversity of any group: rocks, minerals, or, in this case, office supplies. In studies where "diversity" is an important measure, we need a way to quantify it. 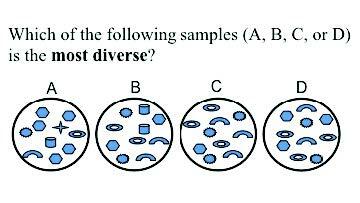 How do we decide if a sample is more or less diverse than another?" What are THESE rocks (and how did they form)? 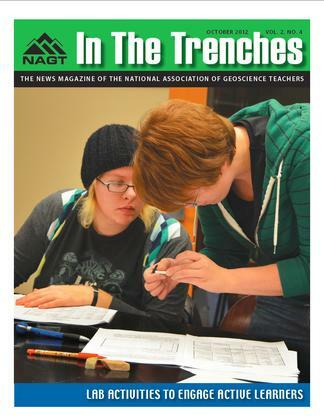 NAGT and the GSA Education Division have announced the 2012 winners of their geoscience education awards. These awards recognize excellence in the k-12 classroom, in two- and four-year colleges and universities, and writing on the topics of geoscience and education. You can find out more about the various awards programs run by NAGT on the website. Information about the GSA ED Biggs Award is available on their website. Using Indoor Labs: Indoor Labs are structured investigations and experiments of materials, models, and other equipment. Using Field Labs: This module provides tips and help for getting students outside. Game-Based Learning: Learn how to start using games to help teach geoscience students. EarthLabs units offer sequences for learning science concepts through hands-on experiments and data analysis. Using satellite imagery, numerical data, computer visualizations, and video, students explore Earth system processes and build quantitative skills that enable them to objectively evaluate scientific findings for themselves. Site Guides are single-page introductions to finding the best resources at Teach the Earth for popular topics.